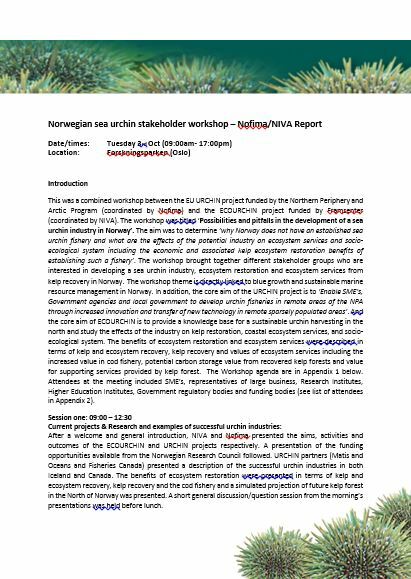 This was combined workshop between the EU URCHIN project funded by the Northern Periphery and Arctic Program (coordinated by Nofima) and the ECOURCHIN project funded by Framsenter (coordinated by NIVA). The workshop was titled ‘Possibilities and pitfalls in the development of a sea urchin industry in Norway’. The aim was to determine ’why Norway does not have an established sea urchin fishery and what are the effects of the potential industry on ecosystem services and socio-ecological system including the economic and associated kelp ecosystem restoration benefits of establishing such a fishery’. The workshop very successfully brought together different stakeholder groups who are interested in developing a sea urchin industry, ecosystem restoration and ecosystem services from kelp recovery in Norway. Attached is a report from the workshop together with pdf versions of the presentations.